The seventh Star Wars film officially has a name now—and the internet has a surprising amount to say about a subtitle. Mostly, there are a lot of jokes out there. It's hard not to poke some fun at the title, which manages to be both grandiose and generic. 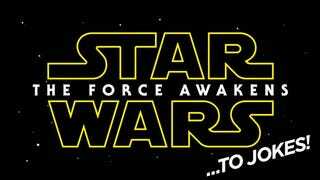 If nothing else, "The Force Awakens" opens up the door for tons of puns about the Force being asleep. Sure, there is tons of hype about the new movie...along with cynicism about Star Wars as a money-making machine. But regardless of how you feel about the upcoming movie, one thing is clear: everyone is talking about it. Here's some of what the internet had to say about The Force Awakens. What about you, how did you react to the new name?